...and invite you to collect what wealth you can. But beware; within the dungeon lurks terrible creatures and deadly traps ready to destroy the unwary. And if you should fail to reach an exit by the time the sun sets, the doors will close and there will be no escaping the wrath of the Dragonlord Kalladra! 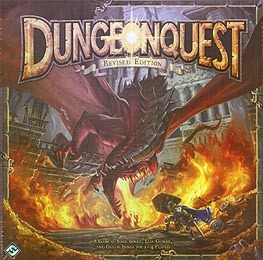 DungeonQuest Revised Edition is a board game of dungeon delving for one to four brave players. Each player controls a hero armed with unique abilities, magical runes of power, and plenty of fool-hardy courage to help him face the horrors of Dragonfire Dungeon. Any heroes fortunate enough to find the central treasure chamber can attempt to plunder its riches, but if they are too greedy or linger too long, Dragonlord Kalladra will awake. DungeonQuest Revised returns the game to its timeless and beloved roots by refining the ruleset, simplifying combat, and introducing a few new challenges that are sure to please the game's legion of veteran fans. Dare You Face The Dragon's Challenge!